Str. "Frank E. Kirby" early in her career. Str. 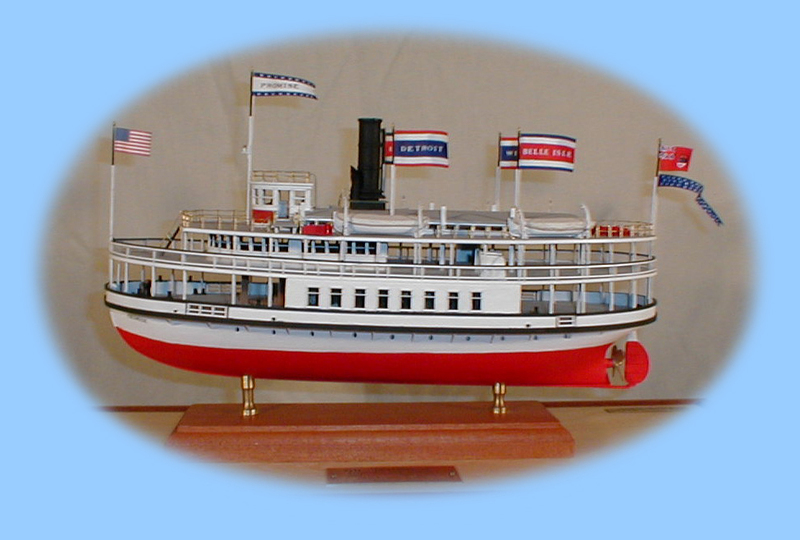 Frank E. Kirby - Steel Passenger Sidewheeler built in Wyandotte, Michigan as hull no. 101 in 1890. This steel-hulled, side-wheel passenger vessel was named after the greatest Naval Architect ever produced by the Great Lakes region. Frank E. Kirby was considered a child prodigy and was sent to study marine engineering and naval architecture at New York's Cooper Institute, at the age of 13. 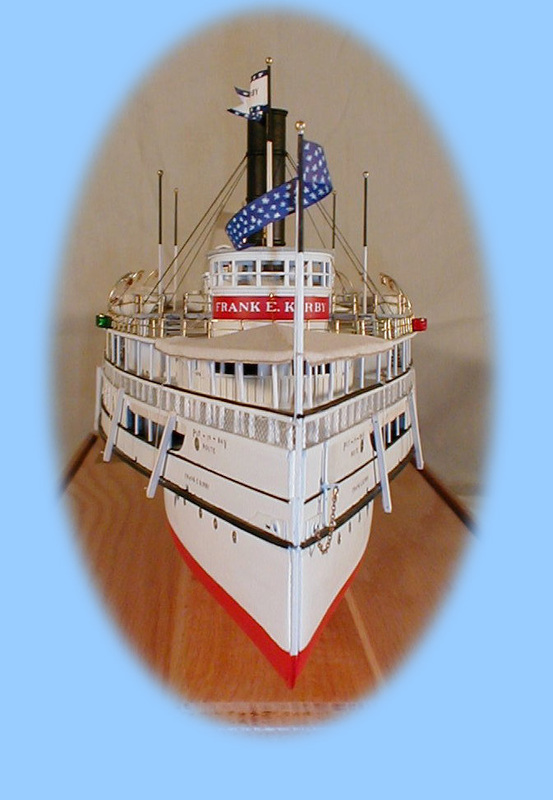 Built for the Ashley & Dustin Steamship Co., the "Frank E. Kirby" was one of the fastest ships on the river even though she was powered by a rebuilt engine that had been in two previous vessels. She was designed for both passenger and freight service between Detroit, the Put-in-Bay Islands, and Sandusky, Ohio. 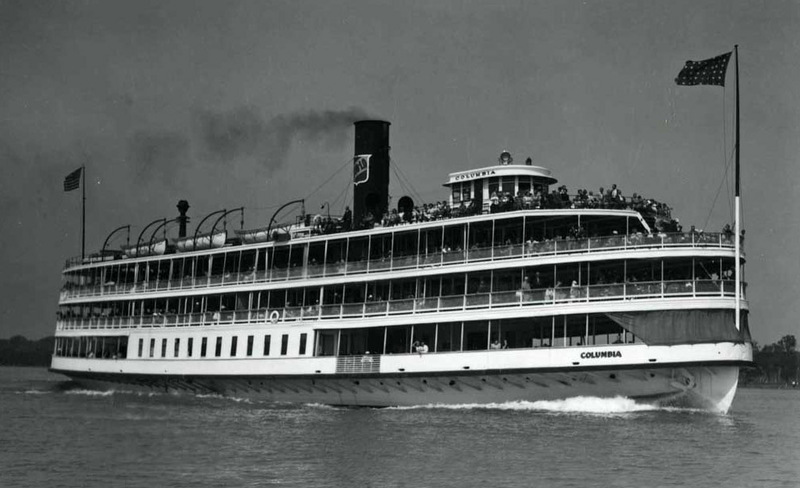 The ship was a favorite among Detroiters and became a popular challenger to the "Bob-lo" boats during informal races down the river. A broom was frequently attached to her pilothouse mast as her master claimed she could beat any boat on the Lake "in a clean sweep". Replaced by a more modern vessel in 1911, she was sold and renamed a number of times until she finally burned at her Ecorse, Michigan slip, during lay-up on June 23, 1932. While rebuilding her was considered, the Great Depression forced her owners to accept the insurance money and she was scrapped on site. The Composite Vessel Str. 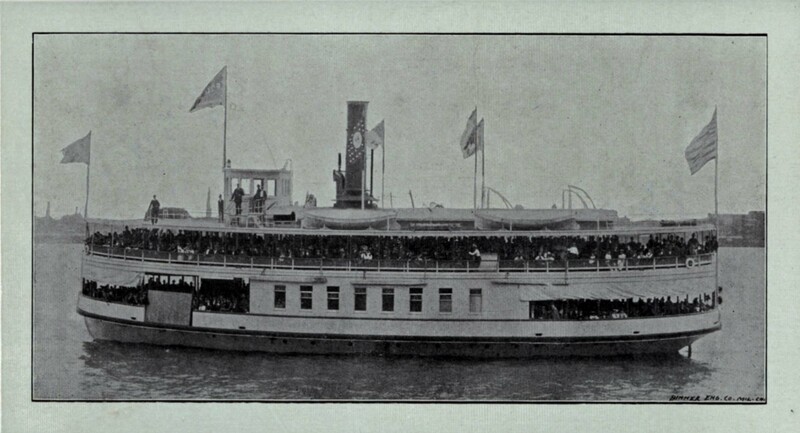 "S. R. Kirby" opening the navigation season c.1900. Str. 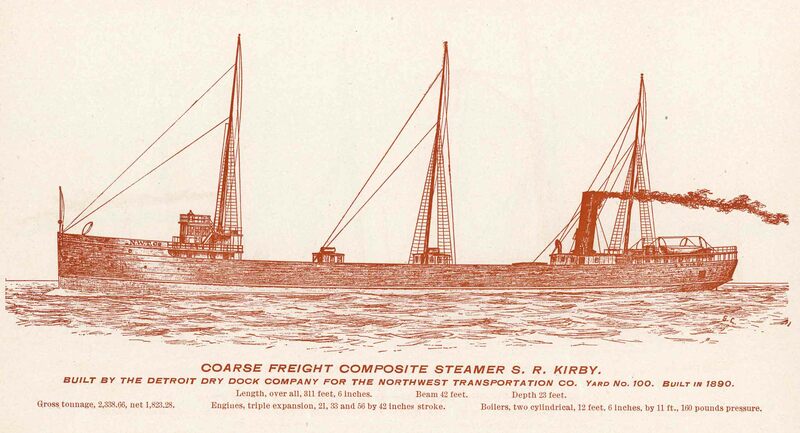 "S. R. Kirby" - Composite Bulk Freighter, built by the Detroit Dry Dock Company, in Wyandotte, Michigan, as hull No. 100 in 1890. 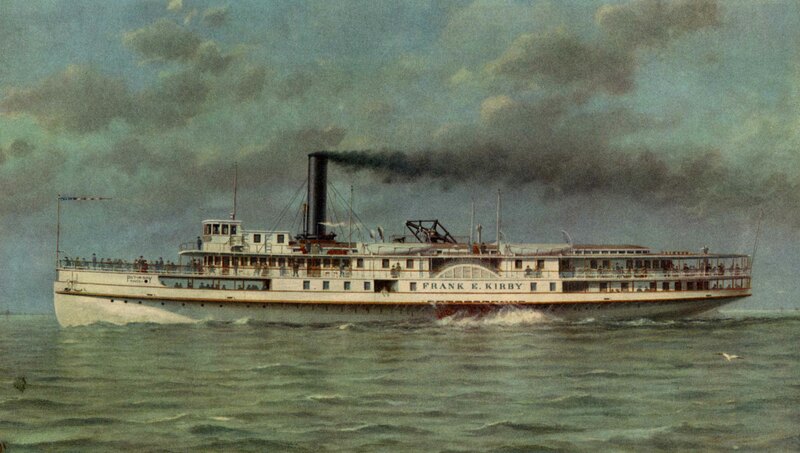 The "S. R. Kirby" was named after the father of Frank E. Kirby who also happened to be the incorporator and President of the Detroit Dry Dock Company. She was the largest "composite" vessel ever constructed on the Great Lakes, at nearly 300 feet long. Frank and his brother, Fitzhugh A. Kirby, had perfected (though they had not invented) the composite design in the 1880's for this shipbuilding firm. By building the frames ("ribs" to the layman) of iron they got the strength of a metal vessel, but as she was sheathed in white oak they were able to also achieve great cost savings in both her design and in future repairs. Built for the North Western Transportation Co., of Detroit, she spent many years hauling coal, iron ore, and grain to Lake Erie ports. On May 8th, 1916 while heavily loaded with ore on Lake Superior, the "Kirby" went down with all but two of her crew of 22 men. Her wreck is still sought after by divers and the exact reason for her sinking remains a mystery. Str. "Promise" during 1893 her first full season of operation. Str. 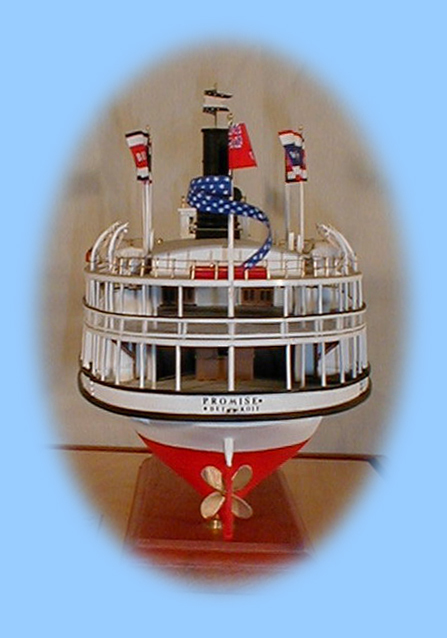 "Promise" - Wooden Cross River Passenger Ferry built by the Detroit Dry Dock Company in Detroit, Michigan, as Hull No. 108 in 1892 Built for the Detroit, Belle Isle & Windsor Ferry Company, the "Promise's" sturdy wooden hull was laid down at the old J.P. Clark Shipyard (at the foot of Clark St. in Detroit) which was then being leased (& eventually bought) by these shipbuilders due to the overflow of construction at their Orleans Street wooden shipyard. 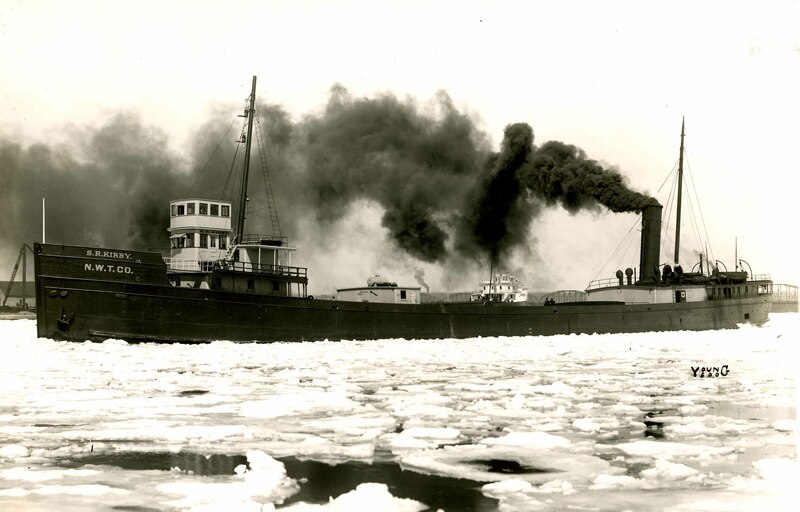 She had an extremely thick oak hull and was designed not only to carry passenger & freight traffic across the Detroit River, but to serve as a year round ice-breaker, as well. She made history on June 18th, 1898, when the D. B. I. 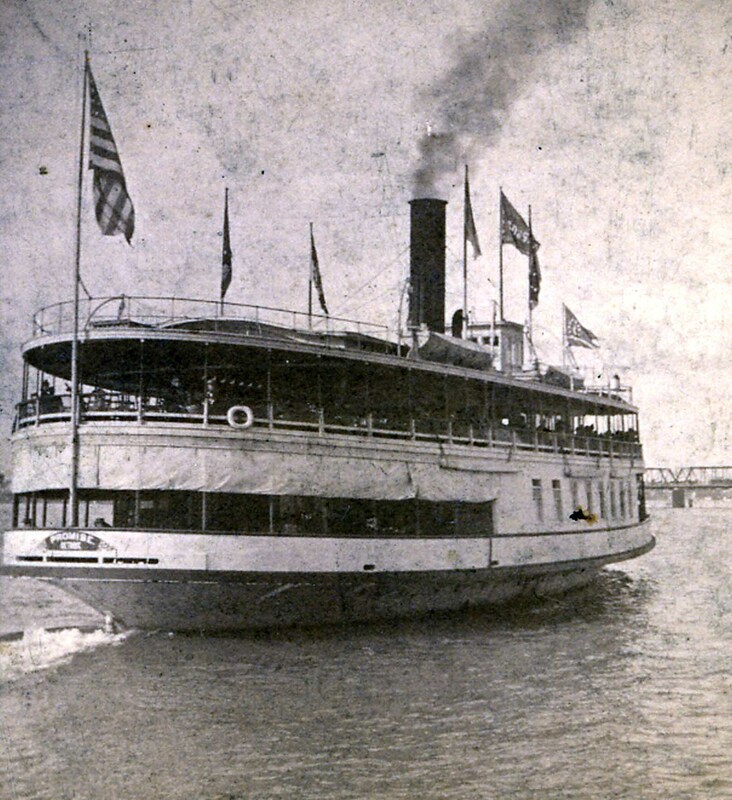 & W. F. Co., used her to ferry their first group of excursion passengers to their newly developed "Bois Blanc Amusement Park & Field;" better known as "Bob-lo Island". She is considered the "grandfather" of the later Bob-lo boats, as Kirby enlarged and refined her lines in the later "Pleasure" (1894) & "Columbia" (1902). The wooden ferry finally outlasted her usefulness and she was scrapped at Detroit in 1935. Stern view of the Str. "Promise" on her way to Belle Isle. Str. "Columbia", a Captain Bill Taylor photo from the 1930's. Str. 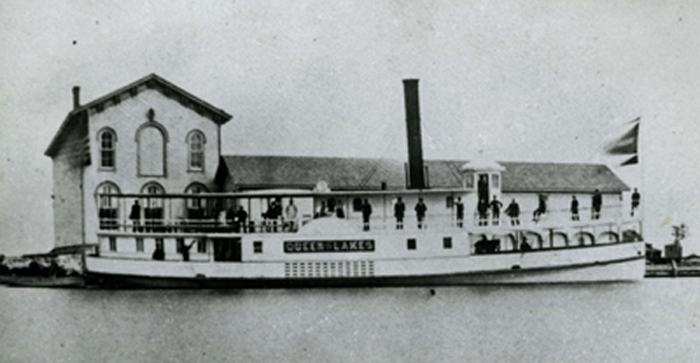 "Queen of the Lakes" docked at Elk Rapids c.1880. 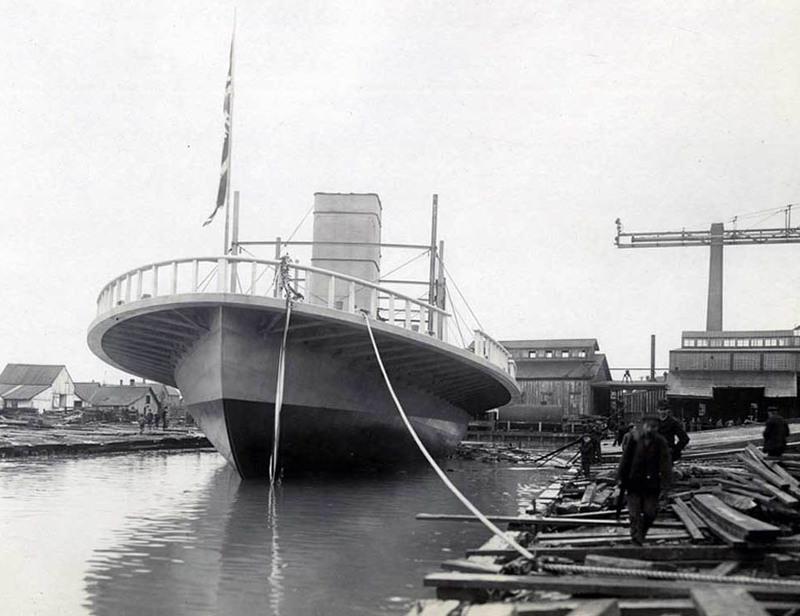 The Ship - Launched at the end of May in 1872, hull no. 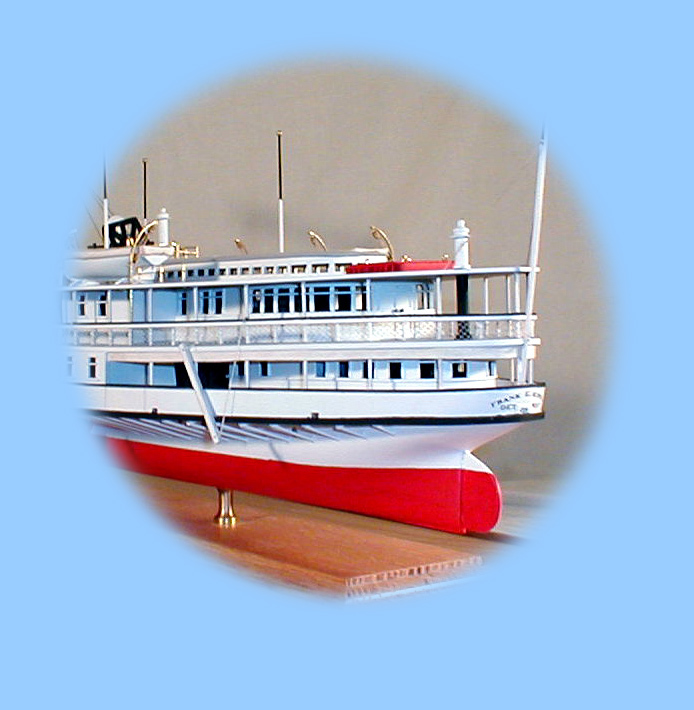 1, the small iron side-wheeler "Queen of the Lakes" was built by the Wyandotte Iron Ship Building Works for the firm of Dexter & Noble, the large department store owners and developers of the Elk Rapids, Michigan region. 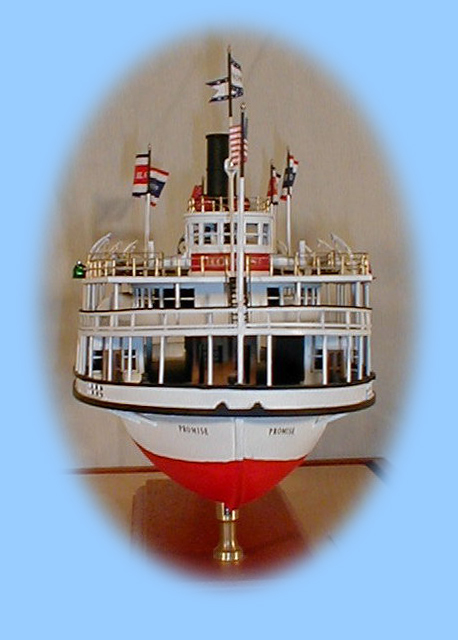 "Queen of the Lakes" has the distinction of being the first metal ship ever constructed and launched in Michigan. 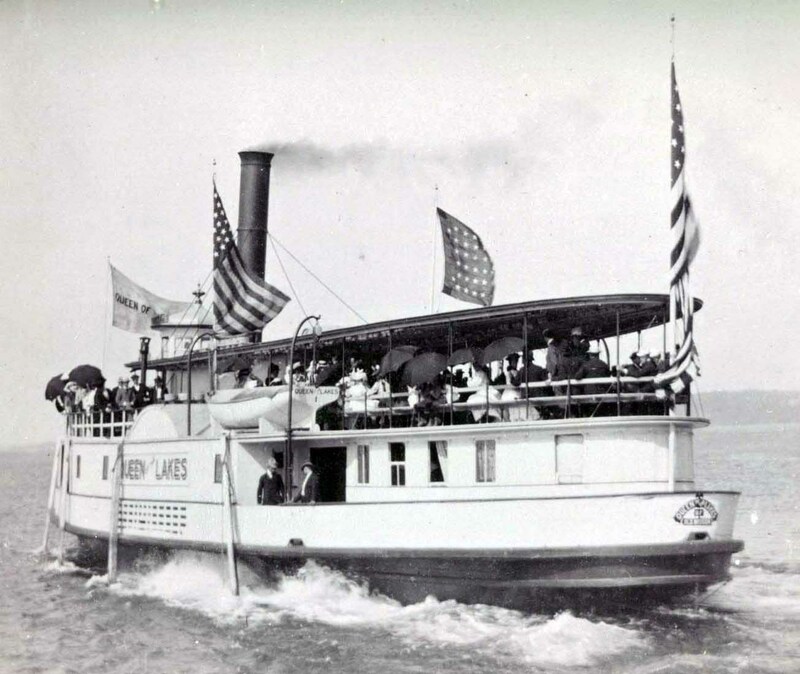 As the first vessel of the Kirby brothers to be completed, her arrival on the "Inland Lakes Route" was much anticipated by the residents of Michigan's "pinky" area.